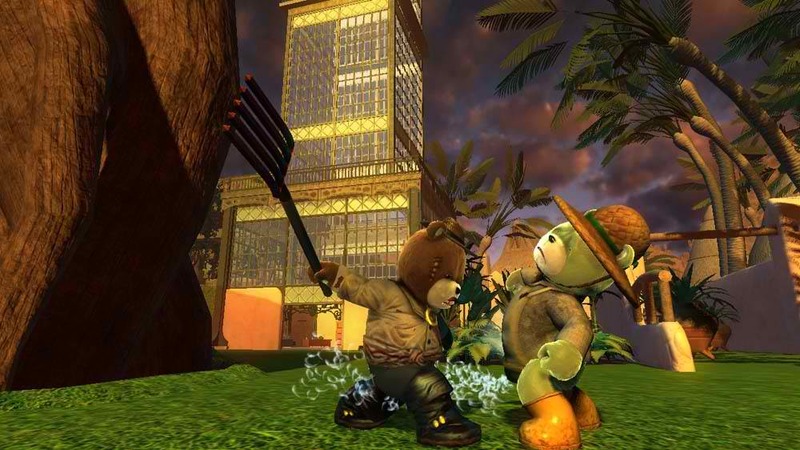 Naughty Bear was originally a full-fledged game for the X-Box 360 and PS3 in 2010, but I never played that version. Instead, this downloadable game, Panic in Paradise, is my first foray into the world on this very mean and violent teddy bear. With bear vs. bear violence and cotton flying everywhere, it seemed like my kind of game. Does Panic in Paradise dress to impress or is it all fluff? Story: So, the story is definitely not the strong point for this title, but it works nonetheless. It seems all the teddy bears have went off on a vacation to a paradise island, leaving behind the black sheep of bears, Naughty Bear. Little do they know, the unwanted bear has stowed away on the bus and is seeking revenge on all other bears. For this bear, revenge comes in the form of beating and destroying the other bears in a creative manner. Design/Art: The design of Naughty and his bear brethren is extremely well done. The fur texture, the detail, and the cotton that spews from the other bears upon their demise: it all looks amazing. Plus, the diversity in bears, from costumes to even robotic bears, is very much welcome as it provides a freshness from level to level and Naughty dispenses his own type of justice. Gameplay: This third person adventure game has some really solid game mechanics, which remind me of the sandbox/adventure game Dead Rising. Various weapons are available for you to use, including all the weapons brandished by the other bears. Also, there are stage interactions which help in defeating the other bears in new and innovative ways, including getting eaten by a shark plant or stuck to a prickly cactus. Costumes play a part in the game as well, as you can disguise as other bears and defeat the boss bear in the stage with ease. Each stage has one specific bear that you need to eliminate, sometimes with special instructions. After that, it’s a free for all that is both enjoyable and engaging. Overall: From what I have read, the original Naughty Bear game was met with lukewarm to bad reviews. If it played anything like this, I can’t imagine how anyone could not have fun with this title. No, it doesn’t do anything groundbreaking, but every game doesn’t need to break the mold. Panic in Paradise is a very enjoyable game with tight mechanics and a fun premise, and I recommend it for anyone that just wants to have fun in video games again. An amazing game, I give Naughty Bear- Panic in Paradise a 9 out of 10. Next Axe Cop Animated Halloween Clip + Axe Cop Voiced by Nick Offerman!! !